Yoenis Céspedes Milanés was originally signed as an international free agent on March 3, 2012 by the Oakland Athletics...Spent eight seasons (2003-10) playing for Granma in Cuba's Serie Nacional...Finished his career with 177 home runs and a .565 slugging percentage...Established residency in the Dominican Republic following the 2010-11 Serie Nacional season...Played for Cuba in the 2009 World Baseball Classic...Batted .458 (11-24) with two home runs and five RBI in six games...Became the 11th Cuban-born player to play for the Mets...His mother, Estela, was a pitcher for Cuba at the 2000 Summer Olympics in Sydney, Australia...Enjoys fishing, golfing and spending time on his farm. On the 10-Day Disabled List on May 16 (retroactive to May 14) with a mild strain of the right hip flexor...Was activated on July 20, then placed on the 10-Day Disabled List on July 24 (retroactive to July 21) due to surgery on both heels...Was transferred to the 60-Day Disabled List on July 31...Underwent surgery to remove bone calcification in his right heel on August 2 in Green Bay, Wisconsin...Had surgery on his left heel on October 26...Dr. Robert Anderson performed both procedures...Had 25 RBI in March/April, fifth-most in the majors and tied for second-most ever by a Met through April with John Buck (25 RBI, 2013)...Only Jeff Kent (26 RBI, 1994) had more...His six March/April homers gave him 19 home runs in March/April since 2016 (his first March/April with the Mets)...The 19 homers are ninth-most in the majors in March/April since 2016...Has 33 home runs in 146 career March/April games, most of any month in his career...Beginning on April 17, hit safely in 17 of his final 23 games of the season, going 26-82 (.317) with five doubles, six homers, 17 RBI and a .967 OPS...Made 36 starts in left field and one at DH...Belted his sixth career grand slam on April 18 vs. Washington off A.J. Cole...Was his fifth grand slam since he joined the Mets in 2015...Homered in each of his last two games of the season, May 13 at Philadelphia and July 20 at Yankee Stadium. On the 10-Day Disabled list from April 28-June 10 with a left hamstring strain and also from August 26- end of the season with a right hamstring strain...Hit his 150th career homer with his three-run, go-ahead homer in the third inning on August 11 at Philadelphia...Is one of seven Cuban-born players in major league history to reach the 150-homer mark...The others are Rafael Palmeiro, José Canseco, Tony Perez, Tony Oliva, Minnie Minoso and Kendrys Morales...Tied the franchise record with three home runs on April 11 at Philadelphia (also had a double, five RBI and three runs scored)...Became the first Mets player to have multiple three-homer games (his other three homer game came on August 21, 2015 at Colorado)...His four extra-base hits tied a franchise record and he is the first player in Mets history to have a pair of four extra-base hit games...Batted .321 (45-140) with nine doubles, two triples, eight home runs, 23 RBI and 25 runs scored in 39 games following the All-Star break...Over his final 15 games, hit .404 (19-47) with three doubles, five home runs, 11 RBI and 10 runs scored...His home run in the first inning on April 11 at Philadelphia was his 50th as a member of the Mets (came in his 197th game as a Met)...The only player who reached 50 homers as a Met quicker was Dave Kingman, who did it in 164 games...Research courtesy of Elias...By hitting three home runs in the first five innings on April 11, Céspedes joined Gary Carter (1985 at Padres) and Kirk Nieuwenhuis (2015 vs. Arizona) as the only Mets to hit three home runs within the first five innings of a game...Research courtesy of Elias...Turned in a two-homer game on April 13 at Miami to give him five home runs over a three-game span from April 11-13...Only four other Mets have had five home runs in a three-game span...Frank Thomas (six in 1962), Gary Carter (1985), Carlos Beltran (2006) and Lucas Duda (2015)...Hit six home runs in the club's first 10 games...The only other Mets to hit six or more home runs in the team's first 10 games of the season were Dave Kingman, who hit seven in the Mets' first 10 games in 1976, and John Buck, who hit six in 2013...Activated off the 10-Day DL for Game 1 of a doubleheader in Atlanta on June 10...Went 2-5 with his fifth career grand slam...Was his first grand slam since September 11, 2016, which also came in Atlanta...The only other visiting player to hit multiple grand slams against the Braves over a twoseason span was Frank Schulte for the Cubs...Schulte hit two grand slams against the Boston Braves in 1911...Research courtesy of Elias...Homered in three straight games from August 11-14...Was the first time he'd homered in three straight games since September 1-4, 2015 and his fourth time overall (second with the Mets). Was named an All-Star for the second time in his career...Was selected to start the game for the National League but did not participate due to injury...Named a NL Silver Slugger...Finished eighth in the NL MVP voting...Reached the 30-homer plateau for a second time in his career...Had a .530 slugging percentage, ninthbest in the National League...His 31 home runs were tied for ninth-most in the NL...Was on the 15-Day Disabled List from August 4-19 with a strained right quad..After he returned from the DL, the Mets were 26-10 in the 36 games that he started...Has hit at least 20 home runs in each of his first five major league seasons, becoming the 18th major leaguer to accomplish the feat...Céspedes reached 20 home runs on July 1, the fastest a Met reached that plateau since Carlos Beltran in 2006...Batted .341 (29-85) with six doubles, six home runs and 16 RBI vs. lefthanded pitching...His 1.081 OPS versus lefthanded pitching was fourth-best in the major leagues (min. 75 at-bats vs. LHP)...Four of his last seven home runs gave the Mets the lead and three of those four came in the seventh inning or later (July 6 at Cincinnati, his walk-off homer on August 29 vs. Miami in the 10th inning and his go-ahead home run in San Francisco on August 21 in the seventh inning).Recorded nine outfield assists, tied for seventhmost in the NL...Connected on two grand slams during the season (April 29 vs. San Francisco and September 11 at Atlanta)...Hit a pinch-hit, three-run homer in the seventh inning to tie the game on April 26 vs. Cincinnati...The pinch-hit, game-tying three run homer to erase a deficit of three runs or more was the fifth home run of its kind in Mets history...Had at least one extra-base hit in a franchiserecord nine straight games from April 15-29...Hit a grand slam and drove in six runs in the third inning on April 29 vs. San Francisco...The six RBI in a single inning set a franchise record for any Met player in team history, passing Butch Huskey's previous mark of five RBI on May 26, 1998 at Florida...The last MLB player to record six RBI in a single inning was Kendrys Morales on July 30, 2012...Hit his 30th home run as a member of the Mets in his 92nd game...According to the Elias Sports Bureau, that was the quickest to 30 home runs in team history...Dave Kingman held the previous mark with 30 homers in his first 111 games...Hit his second career walk-off homer with his walk-off blast on August 29 vs. Miami in the 10th inning...Was his third career walk-off RBI...Turned in his second multi-homer game as a Met on August 20 at San Francisco...Drove in a run in six consecutive games from September 6-12...The six game streak was tied for the second-longest streak in his career. Started in leftfield for the NL Wild Card Game vs. San Francisco. Acquired by the Mets on July 31 from Detroit in exchange for minor league RHPs Michael Fulmer and Luis Cessa...Hit .293 with 18 home runs and 61 RBI in 102 games with the Tigers...Became the 11th Cuban-born player to play for the Mets....Hit a career-high 35 home runs (tied for 13th in the majors), 22 home runs after the All-Star break (tied for fifth in the majors) and 17 home runs after August 1 (tied for the sixth-most in the majors)....Was third in the majors with 83 extra-base hits, was tied for sixth in the majors with a career-high 42 doubles and was ninth in the majors with a career-high 105 RBI...Led the majors with a .623 road slugging percentage... Hit .287 (66-230) with 39 runs scored, 14 doubles, four triples, 17 home runs and 44 RBI in 57 games for the Mets....Had 57 multi-hit games, tied for fourth-most in the majors...21 of those 57 were as a Met...Batted .301 (31-103) in September with seven doubles, three triples, nine home runs, 21 RBI and 19 runs scored...His nine home runs in September were tied for fourth in the majors while his 21 RBI were eighth-most in the majors....Was the NL Player of the Week for September 7-13...Hit .345 (10-29) with four home runs and led the majors with 12 RBI....Is the first Cuban-born player with back-toback 100 RBI seasons since Rafael Palmeiro in 2002-03... Is the second player since 1920 to switch teams mid-season and record at least 15 home runs and 40 RBI within his first 40 games playing for his new squad...Hank Sauer was the first (15 home runs and 47 RBI in his first 40 games with the Cubs in 1949)...Information courtesy of Elias....Hit a go-ahead two-run home run in the eighth inning on September 9 at Washington (5-3 win)... Went 5-for-6 with three home runs, including a grand slam, seven RBI and five runs scored on August 21 at Colorado...The five hits, three home runs, seven RBI and five runs scored all were career-highs...His seven RBI were tied for third-most in a single game in franchise history...His 15 total bases were the second-most in a single game in franchise history... Tied the franchise record and was the third Mets player to homer three times in a game in 2015...Became the third player in history to hit grand slams in both leagues in a single season...Became the first player in major league history to record at least five hits in a game with three home runs including a grand slam... Also became the second Mets player in team history to record five hits, five runs and five RBI in a single game, joining Edgardo Alfonzo who was 6-for-6 vs. Houston on August 30, 1999...Also became the fourth Cuban-born player to hit three home runs in a single game...Information courtesy of the Elias Sports Bureau... Went 3-5 with three doubles on August 3 at Miami...Three doubles in a single game tied a franchise record (28th time)...Reached safely in 16 straight games from August 12-29...Hit .297 (22-74) with three doubles, eight home runs and 18 RBI...Set a career-high with 23 RBI in the month of August...His previous high was 22 set in August, 2014 with Boston...Was 3-for-5 with three extra-base hits on September 7 at Washington...Was his third game with three or more extra-base hits with the Mets...Became the fifth player in team history to have three such games in season... Others were Darryl Strawberry (1987), Carlos Beltran (2006), David Wright (2008) and Lucas Duda (2015). Homered twice and drove in four runs in five games during the NLDS vs. Los Angeles...Batted .286 (4-14) during the NLCS vs. Chicago with a double and three RBI...Started all five games of the World Series vs. Kansas City. Opened the 2014 season with the Oakland Athletics before being acquired by the Boston Red Sox along with a 2015 competitive balance draft pick in exchange for Jon Lester, Jonny Gomes and cash considerations on July 31...Selected to the American League All-star squad for the first time in his career...Won the State Farm Home run Derby for the second consecutive year...Established career highs with 156 hits, 36 doubles, six triples, 100 RBI, 64 extra-base hits and 270 total bases...Finished the season ranked ninth in the American League with a .338 (25x74) batting average with runners in scoring position and two outs -- hit .545 (6x11) with the bases loaded...Led the major leagues with 15 game-tying or go-ahead RBI in the 7th inning-or-later and 16 outfield assists...Established a career-high with five RBI on May 18 at Cleveland, May 31 versus Los Angeles and July 23 versus Houston -- tied for first in the American League with three games with five-or-more RBI...Matched a career-high with two home runs on June 4 at New York's Yankee stadium -- also hit two home runs on July 23 versus Houston...Compiled a career-high 16-game hitting streak June 14-July 2 -- batted .328 (21x64) with three doubles, two home runs and 13 RBI during the streak...Batted .324 (35x108) with six doubles, four home runs and 18 RBI in 26 games during June -- tied for 10th in the American League with 18 RBI during the month...Scored a run in seven straight games from August 9-16...Drove in a run in five straight games from August 22-26...Matched a career-high with four hits on September 5 versus Toronto, including his second career walk-off hit with a bases loaded single in the bottom of the 10th inning...Batted .299 (28x141) with five doubles, one triple, seven home runs and 17 RBI against lefthanded pitchers...hit .279 (128x459) with 31 doubles, five triples, 15 home runs and 83 RBI with righties on the mound...Posted a .252 (72x286) batting average at home...batted .268 (84x314) on the road...Hit .246 (87x353) with 53 runs scored, 21 doubles, three triples, 14 home runs and 56 RBI in 90 games prior to the All-Star break...batted .279 (69x247) with 15 doubles, three triples, eight home runs and 44 RBI in 62 games following the break. Batted .240 with 26 home runs and 80 RBI in 135 games in his second season in the majors…the home runs were a career high but his batting average dropped 52 points from his .292 in 2012…joins Bob Johnson (1933-34) as the only players in Athletics history to hit 20 home runs in each of their first two seasons…joins Johnson and Al Simmons (1924-25) as the only players with 80 or more RBI in each of their first two years…led the A's in triples (4)…hit .237 or lower in each of his first five months of the season…then batted .314 in September…had a .280 (45-for-161) batting average with 11 home runs against left-handed pitching compared to .223 (82-for-368) with 15 home runs against right-handers…slugged .516 against lefties, .410 against righties…tied for fourth in the American League in home runs against lefties…drew 20 of his 37 walks against lefties for a .364 on-base percentage, compared to .262 against righties…hit .225 with 15 home runs and 43 RBI in 79 games before the All-Star Break…then batted .261 with 11 home runs and 37 RBI in 56 games after the break…his career numbers are .240 (121-for-505) before the break, .290 (148-for-511) after the break…started all five games against Detroit in the ALDS and hit safely in each contest…went 8-for-21 (.381) with a team-leading four RBI…has now hit safely and started in left field in each of the A's 10 postseason games over the last two years (14-for-40, .350)…that is the longest ALDS hitting streak in Oakland history and the third longest hitting streak in Athletics postseason history…hit .214 against a pitcher the first time he saw him in a game, .274 after that…batted .193 with two outs, including .188 with runners in scoring position and two outs…hit .215 on the road, which was second lowest in the AL (Bautista, TOR .213)…had a .188 average in the seventh inning or later, which also was second lowest in the AL (Wells, NYY .181)…made 133 starts, including 91 in left field, 26 at designated hitter and 16 in center field…had 10 assists, which tied for sixth among AL outfielders…has 19 assists over the last two seasons, including 15 as a left fielder, which is third most among AL left fielders over that span…the A's were 83-50 (.624) with him in the starting lineup, 13-16 (.448) when he didn't start…in his two seasons, the A's are 165-96 (.632) with him in the lineup, 25-38 (.397) without…the A's went 18-5 (.783) in games in which he homered and are 34-12 (.739) in his career…made a team-leading 72 starts batting clean-up…also hit third 35 times, fifth 25 times and sixth once. OAKLAND: Was the A's Opening Day starter in left field April 1 against Seattle, the A's 14th different Opening Day starter in left field in the last 14 years…was batting .200 with three home runs and seven RBI in 11 games when he was placed on the 15-day disabled list April 13 with a strained muscle in his left hand…it was his second career stint on the DL as he was out from May 7-31, 2012 with a muscle strain in his left hand…went 3 for 9 (.333) with a home run and four RBI on a three-game rehab assignment with Triple-A Sacramento…was reinstated April 28 and went 11-for-38 (.289) with three home runs, 11 RBI and nine runs scored in his first nine games following his return…went 1-for-8 with his first career four-strikeout game in the A's 19-inning contest against Los Angeles (AL) April 29…had his first career four-RBI game April 30 against Los Angeles (AL)…matched that mark June 21 at Seattle and July 28 against Los Angeles (AL)…was hit by a pitch twice May 1 against Los Angeles (AL) to tie an Oakland record…had a career-high 0-for-16 streak from May 8-12 and went 3-for-34 (.088) with no walks over a nine-game stretch from May 8-17…that dropped his average to .196 but he would go on to hit safely in a career-high 12 consecutive games from May 18 to 30…went 15 for 50 (.300) with five doubles, a triple, two home runs and nine RBI during the streak…was caught stealing June 1 against Chicago (AL), his fifth caught stealing against just two stolen bases to start the season…was successful in five of his final seven attempts…had the first two two-homer games of his career June 4 at Milwaukee and June 6 at Chicago (AL)…became the first Athletic with two multi-homer games over a three-game stretch since John Jaha did it in back-to-back games June 19-20, 1999 at Detroit…was batting .245 with 13 home runs and 35 RBI in 48 games through June 6…then hit .185 with two home runs and eight RBI over a 36-game stretch from June 7 to July 27…both of the home runs over that span were hit June 21 at Seattle, his third career two-homer game…went 0 for 4 June 29 against St. Louis to snap a 12-game interleague hitting streak dating back to 2012 (15 for 50, .300)…the streak tied for the third longest interleague hitting streak in Oakland history.…had his second career two-steal game July 12 against Boston…the other was also against the Red Sox (Sept. 1, 2012)…won the Home Run Derby at Citi Field July 15…hit 32 home runs at an average of 405 feet…hit 17 in the first round, six in the second and nine in the finals to defeat Bryce Harper…the 32 home runs tied for third most in a single Derby and 17 in the first round tied for third most in a single round…is the second Athletic to win the Derby (Mark McGwire, 1992) and the first non All-Star…missed the first four games after the break after being scratched from the starting lineup July 19 with soreness in his left wrist…went 2-for-15 (.133) over his first five games following the break but then had back-to-back three hit games July 28 against Los Angeles (AL) and July 29 against Toronto…had seven RBI in those two games…homered in the eighth inning on the 29th against the Blue Jays to snap a career-high 25-game homerless streak…then hit .216 with four home runs and 11 RBI in 25 games in August…the batting average was the lowest single month average of his career…had a .226 batting average overall at the end of August…then hit .314 with six home runs, 19 RBI and 11 multiple hit games in 22 games in September…tied for third in the AL in RBI in September and tied for fourth in home runs…the RBI matched his most ever in a month…now has 13 home runs and 38 RBI in his career in September, his best figures for any month…hit safely in eight consecutive games from Sept. 5-13 and was 13-for 32 (.406) with two home runs, 12 RBI and five multiple hit games over that span…drove in a run in each of the final seven games over that stretch, which was the longest streak by an Athletic since Frank Thomas had a seven-game streak from Sept. 4-11, 2006…homered in three straight games for the second time in his career, Sept. 18-21 (also March 29-April 7, 2012)…tripled and homered in Game 1 of the ALDS against Detroit to join Rickey Henderson (1989 World Series Game 4) as the only two players in Athletics history with a triple and a home run in a postseason game. The 26-year-old rookie from Cuba batted a team-leading .292 with 23 home runs and 82 RBI in 129 games in his first year in the United States...also led the A's in on-base percentage (.356) and slugging percentage (.505)...his batting average was second best in Oakland history among rookies that qualified for the batting title (.307, Mitchell Page in 1977)...also had the third best slugging percentage and fifth best on-base percentage...had the third best home run total by an Oakland rookie, was fourth in RBI, tied for fourth in triples (5), seventh in hits (142) and eighth in strikeouts (102)...added 16 stolen bases and is just the third rookie in Oakland history with at least 10 steals and 10 home runs, joining Mitchell Page (1977) and Jose Canseco (1986)...had nine assists, which tied Tony Armas (1977) for second most by a rookie in Oakland history...the record of 11 was set by Mitchell Page in 1977...finished second to the Angels' Mike Trout in the balloting for 2012 BBWAA American League Rookie of Year, garnering 19 of the 28 second place votes and six third place votes...ranked second among AL rookies to Trout in nearly every category including runs (70), hits, doubles (25), home runs, RBI, walks (43), extra base hits (53), total bases (246) and multiple hit games (40)...was third in triples and fourth in stolen bases...also ranked second among qualifiers in batting, on-base percentage and slugging percentage...his nine outfield assists led Major League rookies and tied for eighth among all AL outfielders...hit .236 over his first 29 games through June 1, .359 over a 45-game stretch from June 2 to Aug. 3 and .267 over his final 55 games...batted .345 with runners in scoring position, which ranked eighth in the AL...also ranked seventh in day batting average (.314) and batting with two outs (.310) and 10th in home batting average (.319)...had a .318 batting average with 11 of his 23 home runs with runners on base (eight two-run, three three-run)...hit .298 against left-handers, .289 against right-handers...batted .263 before the All-Star Break, .311 after the break...ranked fifth in the AL in runs scored (51) after the break and tied for eighth in hits (90)...had a .264 batting average and .425 slugging percentage against a pitcher the first time he saw in a game compared to a .329 batting average and .614 slugging percentage after that...stole 12 of his 16 bases at home...started 128 games at three different positions, including a team-leading 56 in left field...also made 46 starts in center field and batted .320 with seven home runs and 20 RBI in 26 starts at designated hitter...the A's were 82-46 (.641) with him in the starting lineup compared to 12-22 (.353) when he didn't start...committed all three of his errors and had six of his nine assists as a left fielder...made a team-leading 102 starts batting clean-up. Played for Aguilas Cibaenas during the Dominican Winter League playoffs and batted .143 with one double, one home run and two RBI in nine games...did not walk and struck out 10 times. Led Cuba's Serie Nacional in runs (89) and RBI (99), tied for the lead in home runs (33), ranked fifth in slugging (.667) and tied for 10th in hits(118)...the 33 home runs are a league record...named to the All-Star Game but did not appear in the game...hit .368 against left-handed pitching compared to .325 against right-handers...22 of his 33 home runs came with runners on base...including three grand slams...hit three home runs Dec. 15 against Guantanamo...also had three two-homer games...tallied 10 outfield assists...batted .222 with two home runs and eight RBI in 13 postseason games. Played for Cuba in the 2009 World Baseball Classic and hit .458 with two home runs and five RBI in six games...added a double and three triples and scored five runs... was also a member of Cuba's World Cup team and hit .214 with a home run and three RBI in 10 games... in Cuba, ranked third in the league in runs (87), eighth in home runs (22), ninth in slugging (.617) and 10th in hits (118)...batted .316 with eight home runs in 79 at bats against left-handed pitching compared to .354 with 14 home runs in 263 at bats against right-handers...had a pair of two-homer games...connected for a grand slam Nov. 29 against Cienfuegos...had 10 assists as an outfielder...also appeared in two games at shortstop. Tied for third in Cuba's Serie Nacional in home runs (24), tied for fourth in runs (83), ranked ninth in RBI (76) and 10th in slugging (.601)...hit .358 against left-handed pitching compared to .314 against right-handers...hit three home runs Feb. 5 against Guantanamo...also had two two-homer games...collected 11 assists as an outfielder. Ranked second in Cuba's Serie Nacional in home runs (26), tied for third in RBI (78) and tied for fourth in runs (82)...went 0 for 3 in the All-Star Game...hit .306 against left-handed pitching compared to .279 against right-handers...16 of his 26 home runs came with runners on base...including two grand slams...had four two-homer games...tallied 14 outfield assists. Ranked first in Cuba's Serie Nacional in runs (79), tied for third in home runs (17), tied for fourth in stolen bases (15) and RBI (66), fifth in doubles (24), tied for fifth in hit by pitches (14) and sixth in slugging (.541)...went 3 for 4 with a RBI in the All-Star Game to help Orientales to a 2-0 win over Occidentales...hit .359 with five home runs in 78 at bats against left-handed pitching compared to .286 with 12 home runs in 262 at bats against right-handers...had 13 assists in 78 games as an outfielder...also appeared in one game at shortstop. Ranked first in Cuba's Serie Nacional in runs (89), second in home runs (23), fourth in slugging (.649), fifth in RBI (78), tied for sixth in hits (119), tied for seventh in doubles (24)...went 0 for 2 in the All-Star Game...hit .417 against left-handed pitching compared to .333 against right-handers...connected for two two-homer games...belted a grand slam April 22 against Holguin...had eight outfield assists...hit .167 with a home run and four RBI in nine postseason games. March 28, 2019 New York Mets placed LF Yoenis Cespedes on the 10-day injured list retroactive to March 25, 2019. Recovery from heel surgery. November 2, 2018 New York Mets activated LF Yoenis Cespedes from the 60-day injured list. July 31, 2018 New York Mets transferred LF Yoenis Cespedes from the 10-day disabled list to the 60-day disabled list. Twin heel calcifiacations. July 24, 2018 New York Mets placed LF Yoenis Cespedes on the 10-day disabled list retroactive to July 21, 2018. Twin heel calcifiacations. July 20, 2018 New York Mets activated LF Yoenis Cespedes from the 10-day disabled list. 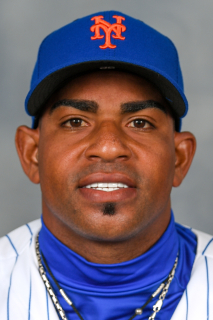 July 17, 2018 New York Mets sent LF Yoenis Cespedes on a rehab assignment to GCL Mets. June 8, 2018 New York Mets sent LF Yoenis Cespedes on a rehab assignment to Binghamton Rumble Ponies. May 16, 2018 New York Mets placed LF Yoenis Cespedes on the 10-day disabled list retroactive to May 14, 2018. Mild strain of right hip flexor. October 2, 2017 New York Mets activated LF Yoenis Cespedes from the 10-day disabled list. August 26, 2017 New York Mets placed LF Yoenis Cespedes on the 10-day disabled list. Strained right hamstring. June 10, 2017 New York Mets activated LF Yoenis Cespedes from the 10-day disabled list. June 8, 2017 New York Mets sent LF Yoenis Cespedes on a rehab assignment to St. Lucie Mets. May 26, 2017 New York Mets sent LF Yoenis Cespedes on a rehab assignment to St. Lucie Mets. April 28, 2017 New York Mets placed LF Yoenis Cespedes on the 10-day disabled list. Left hamstring strain. November 30, 2016 New York Mets signed free agent LF Yoenis Cespedes. November 3, 2016 CF Yoenis Cespedes elected free agency. August 19, 2016 New York Mets activated CF Yoenis Cespedes from the 15-day disabled list. August 15, 2016 New York Mets sent OF Yoenis Cespedes on a rehab assignment to St. Lucie Mets. August 10, 2016 OF Yoenis Cespedes assigned to St. Lucie Mets. August 4, 2016 New York Mets placed CF Yoenis Cespedes on the 15-day disabled list. Strained right quad. January 26, 2016 New York Mets signed free agent CF Yoenis Cespedes. November 2, 2015 LF Yoenis Cespedes elected free agency. July 31, 2015 New York Mets activated LF Yoenis Cespedes. December 11, 2014 Detroit Tigers traded RHP Rick Porcello to Boston Red Sox for LF Yoenis Cespedes, RHP Alex Wilson and LHP Gabe Speier. August 1, 2014 Boston Red Sox activated LF Yoenis Cespedes. April 28, 2013 Oakland Athletics activated LF Yoenis Cespedes from the 15-day disabled list. April 25, 2013 Oakland Athletics sent LF Yoenis Cespedes on a rehab assignment to Sacramento River Cats. April 13, 2013 Oakland Athletics placed LF Yoenis Cespedes on the 15-day disabled list. Strained muscle in left hand. June 1, 2012 Oakland Athletics activated LF Yoenis Cespedes from the 15-day disabled list. May 28, 2012 sent CF Yoenis Cespedes on a rehab assignment to Sacramento River Cats. May 7, 2012 Oakland Athletics placed CF Yoenis Cespedes on the 15-day disabled list. Strained muscle in left hand. March 3, 2012 Oakland Athletics signed free agent CF Yoenis Cespedes. January 12, 2012 OF Yoenis Cespedes assigned to Aguilas Cibaenas.